The events that encompass synaptogenesis—growth cone guidance, axonal and dendritic arborization, dendritic spine growth, even neurotransmitter release, and receptor dynamics—all are calcium-dependent processes. As calcium-dependent molecules, the members of the cadherin superfamily are particularly well suited to mediate shifting requirements for adhesion during these dynamic events. These molecules, which are thought to bind homophilically across synapses, couple to the actin-based cytoskeleton as well as synaptic vesicles, ion channels, and neurotransmitter receptors. 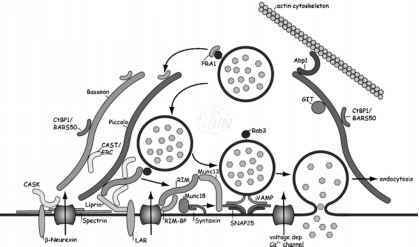 Given these biochemical features, it is not surprising that manipulating cadherin functions compromises normal synapse maturation and plasticity alike. Although the contributions of individual family members to synaptogenesis appear to differ to varying degrees, their fundamental roles in calcium-dependent junctional maintenance are ontogenetically and phylogenetically conserved.